Monster Fatberg While most Loyal Readers may believe that this term refers to an unnamed high-profile person who has a penchant for serving Big Macs and fries to visiting White House dignitaries, it is actually a congealed mass of fat, wet wipes, and diapers currently clogging the London sewer system. Fatburg weighs the same as 11 double-decker buses and stretches the length of two football fields, which is, coincidently, the same as the unnamed individual who serves fast food to folks visiting the White House. Well that was informative! I had no idea London had all of that fat running under the ground. 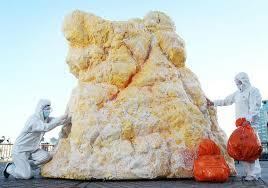 I wish our fatberg was. Actually, I feel like he is. I also feel like he’s behind all my walls and in my plumbing system, and…. I think the great Pacific garbage patch has possibilities as a new country. If we go a few ship loads of glue out there, I bet we could stabilize it enough so it would support a few hotels, an airport, a docks for ships – it would be a great destination. Since garbage will continue to flow to it, the new nation would just grow each year as we glued new pieces of plastic it. Maybe we can give it to POTUS. He gives up the presidency and gets to declare himself as Monarch for Life of a big garbage dump. The blog post or the world in general?